HPB03S Bio-soluble Fiber Braided Square Insulation Gaskets+Steel Wire& Fiberglass Filament Reinforcement--Shanghai Hoprime Industrial Co., Ltd.
HPB03S Bio-soluble Fiber Braided Square Insulation Gaskets+Steel Wire& Fiberglass Filament Reinforcement are made of our high quality Bio-soluble fiber yarns which is made of biosoluble fiber imported from unifrax. They can be used for high temperature applications up to 1000℃. The rope is reinforced with fiberglass filament and S.S.wire. It contains a certain amount of binder material which is normally burned at lower temperature and does not affect the insulation property. They the perfect material for door seals or caulking for ovens, furnaces and boilers, expansion joints, cable or pipe wrapping, high temperature seals or gaskets. These products have been widely used in welding, foundry works, aluminum and steel mills, boiler insulation and seal, exhaust systems, shipyards, refineries, power plants and chemical plants. They are also used as the core in tadpole gaskets. 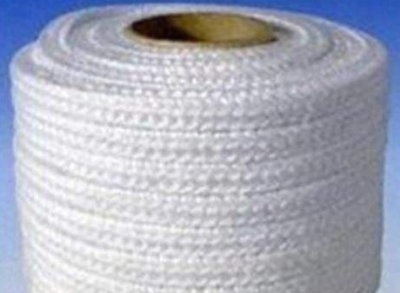 The three different styles are designed to fit different application needs: twisted rope is a soft rope, while square and round braid are more dense and solid.